Cody J. Smith, the Elizabeth and Michael Gallagher Assistant Professor of Neural Development and Regeneration, has been selected as a 2017 recipient of the prestigious Sloan Research Fellowship. Every year the Alfred P. Sloan Foundation selects 126 promising early-career scholars from the fields of science, engineering, technology, mathematics, and economics, as recipients of the Sloan Research Fellowship. Recipients are awarded a two-year research grant in recognition of their distinguished performance and unique potential to make substantial contributions to their fields, and society. Smith explains that his lab studies “how the cells in the nervous system organize in the very early stages of nervous system development.” A graduate of Vanderbilt University, Smith earned a Ph.D. in cell and developmental biology, with a specific focus on neuronal cells. Subsequently, he went on to complete a postdoctoral fellowship at the University of Virginia, where he redirected the focus of his work to glial cells. “Neurons have been studied for years, but these other cell populations called glial cells outnumber the neuronal cells and we know very little about them,” he explained. Glial cells have been a relatively neglected area of research due in part to the fact that they were once perceived as mere supporting cells for neurons, which functionally drive all behaviors. More recently, however, research has shown that glial cells are involved in early development, learning, and memory. Having identified a niche, Smith now studies the intersection of neuronal and glial cells. 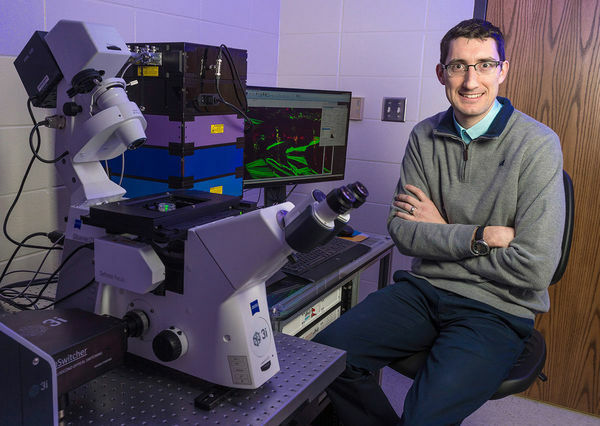 His lab examines how these cells organize to create, maintain and change functional circuits during development, as well as how they impact regeneration. Using time-lapse imaging to observe cells and the proteins within them as they perform various functions in the nervous systems of live zebrafish, Smith and his team are able to gain insight into how these cells and proteins can be targeted to provide therapeutic treatments for spinal injuries and diseases, such as Multiple Sclerosis (MS) and Charcot-Marie-Tooth disease (CMT). The Sloan Fellowship will allow the lab to extend its current research efforts by using the same techniques to answer new questions; utilising time-lapse imaging they will be able to characterize a phenomenon, then apply molecular techniques to reveal unknown determinants and their potential impact on disease. Originally published by Chontel Syfox at science.nd.edu on February 21, 2017.